In a bid to find sass, seeing as I cannot call it from command line, I have gem install sass and followed this StackOverflow answer. Loading that creates a new Ruby folder in my directory and tada! 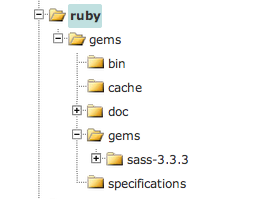 i found sass-3.3.3 sitting pretty in a gems folder. Will dig through this sass folder and see what I find!